Velvet season is officially here. 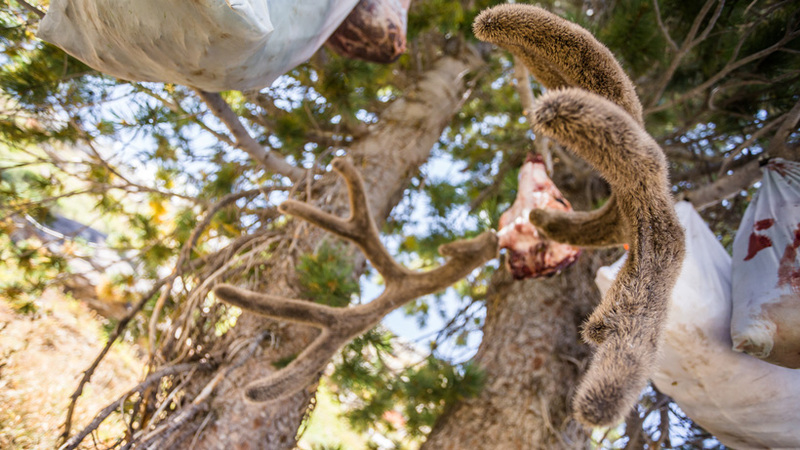 And if you’re hunting mule deer the next month and are going to be doing a backcountry type hunt, it might be a good idea to consider a way to preserve your precious velvet in the field. 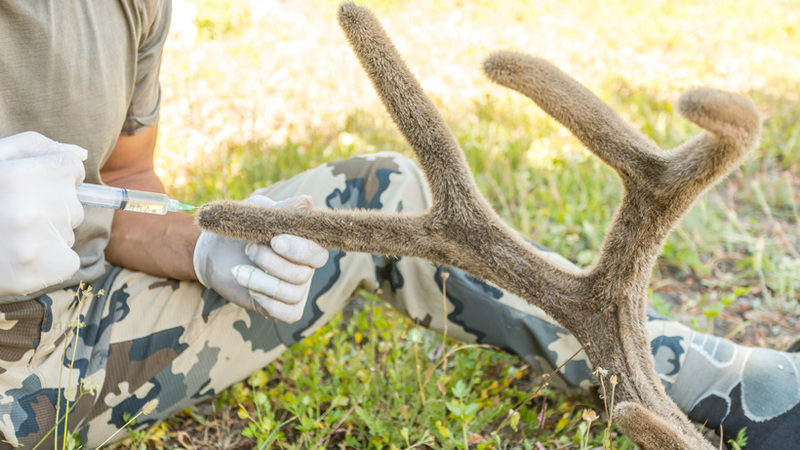 Getting the blood out of the antlers will help prevent the velvet from rotting. There are many different ways to preserve velvet antlers. 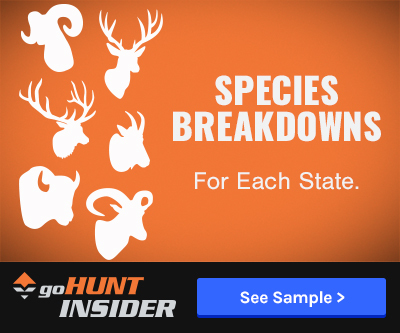 What I'll be discussing here specifically applies to a do-it-yourself approach when you can't get the buck off the mountain for a few days or you're hunting with a friend and can hang the meat and rack while you continue to hunt. Some of the velvet preserve methods you can use are: formaldehyde, Antler in Velvet Tan, 4 in 1 solution and plenty of other ways. 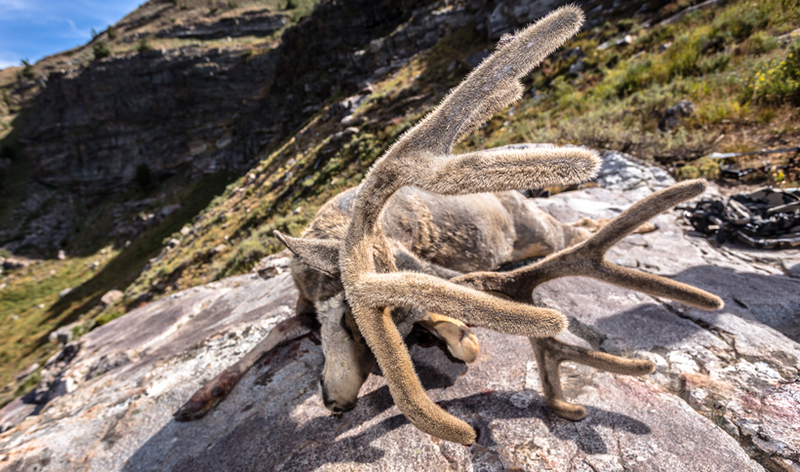 This might seem like a complicated process, so if you're not comfortable doing this, it might be a better idea to rush your deer off the mountain and get it to your taxidermist so he can preserve the antlers with a preserving material or freeze-dry the rack. Also, you could poke small holes in the tips of the rack and hang upside down in a tree in hopes some blood will drain out. I know several people who just hang, and I've even seen their deer after they get off the mountain and nothing was wrong with their velvet before they took it to a taxidermist. In my opinion, keeping the real velvet on a deer mount looks a lot better than fake velvet (and cheaper), so I always preserve velvet in the field. Below you’ll find the method that I’ve been running that I learned from my taxidermist. 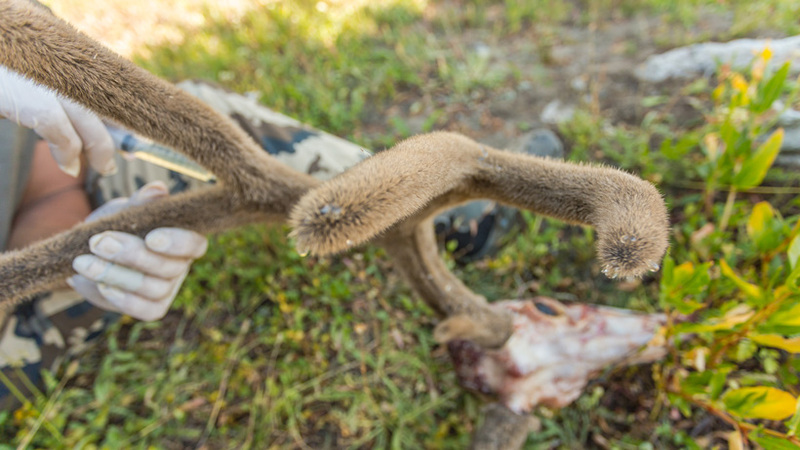 Like I stated earlier, you could just puncture the tips of the antlers and let them sit in the shade upside down… but to me, that just seems like you could be asking for trouble because those small cuts could split open the tissue, attract bugs, and are likely to crack when dry. 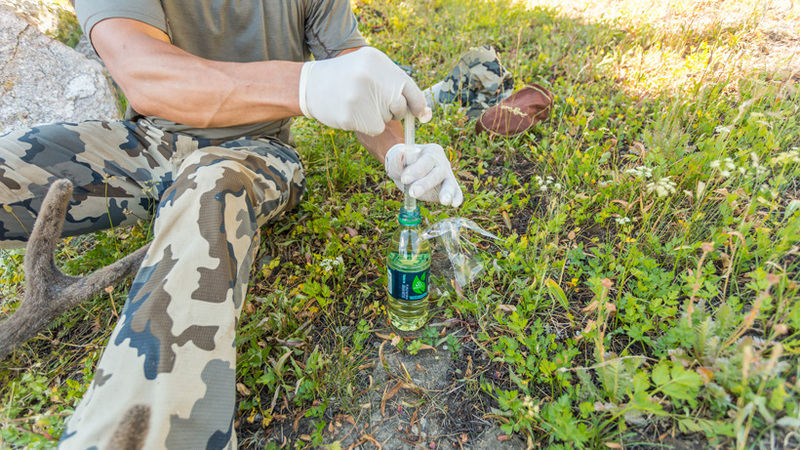 Word of caution: No matter what method of backcountry velvet preserve you’re using (formaldehyde or others), ALWAYS wear eye protection and gloves. The fluid preserves whatever it touches, so don't get it on yourself. Working in the biology field background for so many years, I've seen what formaldehyde can do and it's pretty nasty stuff. I prefer to use formaldehyde that I get in small doses from my taxidermist, but like stated earlier, you can use other "safer" methods. 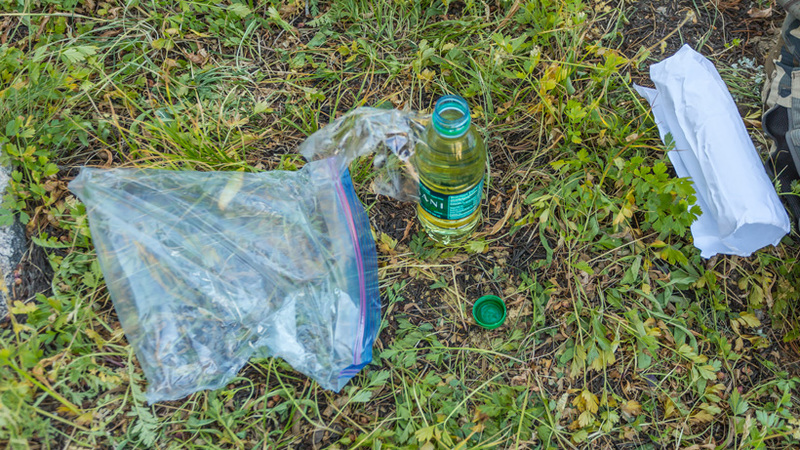 Put on a pair of rubber gloves (normally I double up) and toss on some sunglasses and take your knife and open the package containing your preserve material, syringe, and needle. I normally keep my preserve in an old plastic water bottle to keep weight down and then I wrap it in tons of tape so it won't open up and then I double Ziplock bag it. You can never be too careful! 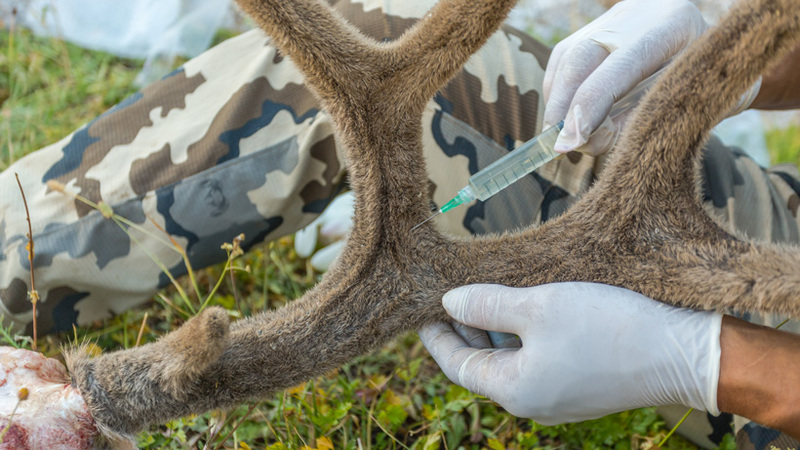 Next, take your syringe needle (or knife) and make a small hole in the tip of each antler tine and even along some of the main veins that are visible along the main beam. This is a step that will aid in getting your velvet preserve/blood in through the veins and to go out the tips of the rack. Take your syringe and pull up some of the solution. I always begin by starting the injection at the bases near the skull and work toward the tips, but you can start anywhere on the rack. Start injecting some of the material into each vein channel. Then work down the main beam and inject into the middle of veins. You'll know you're doing it right when you start to see blood and velvet preserve solution come out of the small holes you poked in the veins or it will start to come out of the antler tips. 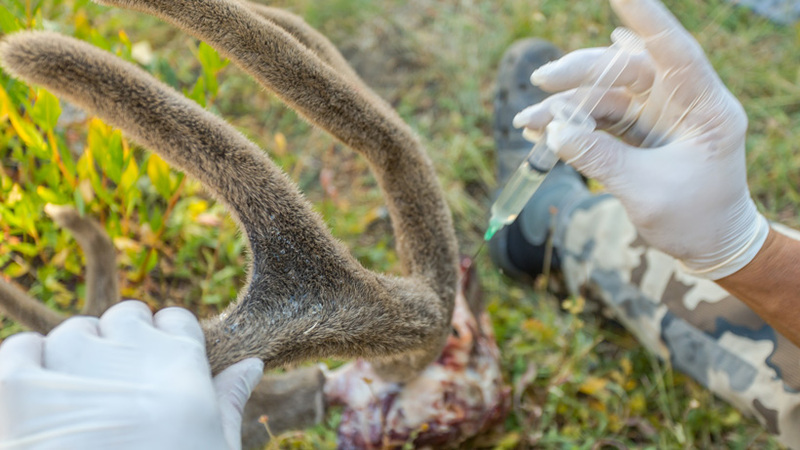 You'll be able to visually see the veins and where to inject, or you can use your fingernail and move it down the antler until you find a vein that is going horizontally across the beam. I like to go top down on the back tines due to the veins having a lot of blood in this area. Then I'll repeat the process and try to get the solution to go out of the tips instead of toward the base. 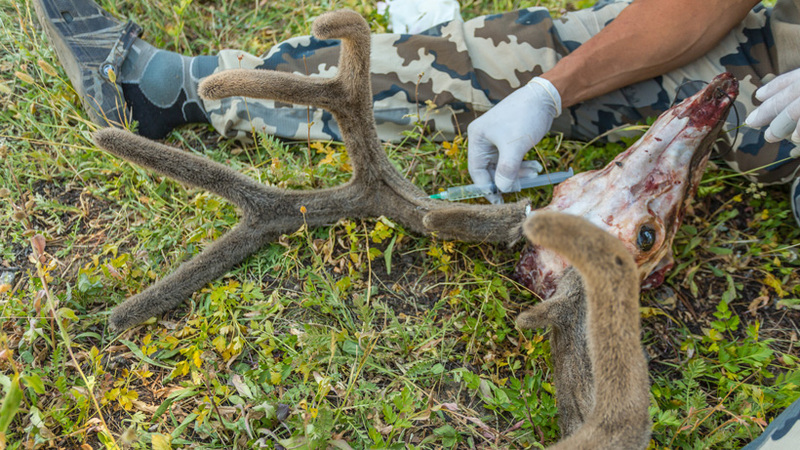 Keep injecting the preserve into all of the veins and even down the antler tips. By this time you should start to see some blood and discolored solution coming out at the tips and bases. I don't feel like you can add to much solution to the antler veins. So I'll go over each antler several times to make sure I got in each vein. You’ll want to continue to inject the solution down the vein lines until the preserve that's coming out of the tips of the tines is the same as the color as the solution. You may notice some blood at first, but in the end, you should have the clear solution flowing out of the velvet. Once you’ve finished working over each antler, you’ll want to find a nice shady area to hang the antlers in a way that animals can't get to it. Note: At this stage, I'll continue to hang my antlers upside down to let the preserve flow out of the velvet. Once the solution has dried and you no longer see anything coming out of the antler tines, you can then apply some of the solution lightly over the velvet. You could use a brush at this stage if you want to pack one into the mountains, but my preferred method is to just use the syringe and lightly spray the solution and then brush the velvet with my hand. My taxidermist told me about this step and he said this is commonly overlooked, but highly important because this step will prevent small bugs from trying to enter the velvet and get into the areas that have no blood. After all of these steps, you'll have a nice velvet rack that you can be proud of and your velvet won't rot off. 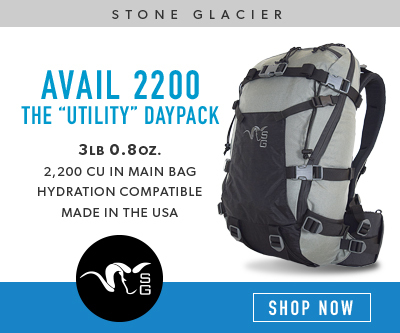 Once you get off the mountain, try to take the rack to a taxidermist right away, or place the entire rack in a freezer until you can get it sent off. I feel stupid for asking this, but what happens if you can't preserve it? Does it end up just looking like a normal hard horned buck when you mount it? My first mule deer hunt is coming up in a couple weeks and didn't even realize I needed to do anything to preserve them. Thanks for the article! Also, great podcast with Cody Rich today! @Sidney - I really like that toothbrush idea. Plus, a person could always sacrifice their normal toothbrush while on the mountain after you kill... then just replace it with one when they get back home. This is why I love having discussions like this online! Always great sharing new information. A friend of mine in Nevada hung his deer in the shade for two days and his velvet was fine. He shot it on a Saturday afternoon and they didn't pack it out until the following Monday morning. But to throw a curve in, one of the guys in the office shot a buck and didn't recover it until the following morning. And by the time they got his buck out the velvet was in bad shape. So 24 hours is probably a safe bet, and 48 hours might be pushing it. In talking to some guys in the office right now on their experience, a lot of it depends on the deer and how late in the velvet stage you take them. Good stuff Brady, I would recommend a small tooth brush too to dip in the chemical. It's light weight and it's usually tough enough to "fluff" the velvet. How much time do you think we have before it's lost if you don't preserve? @Clint - I avoid touching the rack for at least a day or two with my bare hands. I wear contacts, so I have to constantly touch my eyes multiple times a day to remove and put in contacts on the mountain and for that reason, I avoid the velvet after the preserve. I'm sure it's pretty dry after hanging in a tree... but this is another case of I'd rather be safe than sorry. I had to work around formaldehyde a lot when I did fisheries work in Montana, and it is very powerful stuff. Really, Roy? Why would I do that? Guess we must use the same taxidermist because I followed the method he told me about when he gave me the solution. I guarantee there is nothing in this article that I took from you. Gotta love when people are quick to judge. This is an article that I also wrote several years ago in 2014-ish I believe that I re-publish under a new date each year and every now and then I'll update the article with new photos that I get from the field. And I don't even subscribe to WH. About how long should you let the rack dry before its safe to touch with bare skin? Thanks buddy! 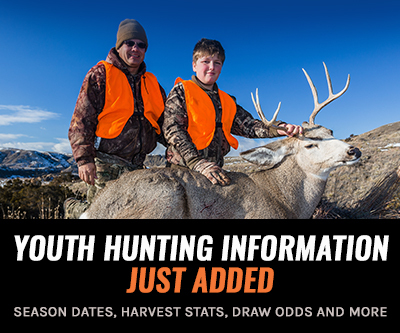 Hope you have some great hunts planned this fall. I know I'm already looking forward to making a bunch of new memories this year. I took a Mnt Caribou in the NWT last year that was in full velvet. We did nothing at all to it, other than to let it drain in a shed. No treatment, no chemicals, no nothing. It is amazing how much blood came out of those antlers. It made it to the taxi in great shape. He mounted it and it is currently on my wall at home. No smell, no drying, no peeling. The velvet is still soft to the touch and in great shape. Looks and feels no different than the first moment I laid hands on that bull. Good stuff for when you are too deep to get em out right away! 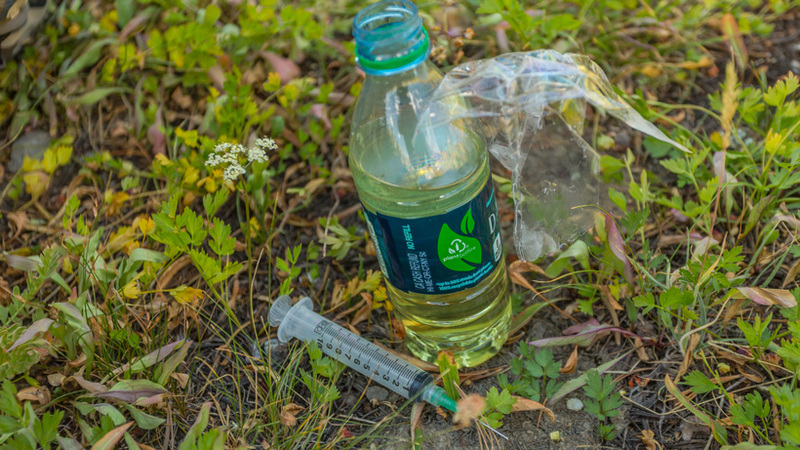 I encourage people to carry a small spray bottle of rubbing alcohol to spray them down with if they are bringing them out in a reasonable amount of time. It will stave off bacterial growth in the short term. I would also recommend having your taxidermist freeze dry them if they aren't already air dried when you get them out of the field. Keep up the good work guys! Thank you, David! Glad you enjoyed it. Great suggestion! I'm hoping to do a video on the next velvet buck I get my hands on. Best of luck to you this year. Wow great article! Thanks for the information, I find this very helpful. I would love to see a video as well.